Uni (oo-nee) is the Japanese name for the edible part of the Sea Urchin. While colloquially referred to as the roe (eggs), uni is actually the animal’s gonads (which produce the milt or roe). Uni ranges in color from rich gold to light yellow, and has a creamy consistency that some love and is off-putting to others. It is nevertheless one sushi item that is in incredible demand around the world, which is reflected in its price. Sea Urchins are a rare treat for those who acquire a taste. 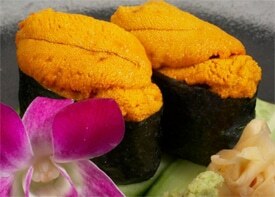 Uni sushi has a light, sweet, and somewhat briny flavor and is is usually enjoyed as nigiri sushi or sashimi. Uni is also sometimes served with a raw quail egg. Uni is also considered an aphrodisiac by some. It is harvested throughout the world, however the west coast of the U.S. has in recent years become one of the largest sources, and much of the harvest finds its way overseas to eager Asian customers. Each sea urchin contains five ‘lobes’ and the harvesting of the uni is a very delicate process as the meat easily falls apart. Uni is a somewhat seasonal item and is at its best when served from late fall through the winter, with December considered the best month by Japanese standards. “Uni” has historically been graded based on color, texture, and freshness. The highest grade is a bright yellow/gold (Grade A) with a firm texture and somewhat sweet. Grade B uni is a more muted yellow and has a softer texture and is less sweet, while Grade C uni is referred to as ‘vana’ and is often the parts left over from uni that has broken apart during processing or handling. Obviously, the higher the grade, the higher the price, and fresh uni taken directly from a living sea urchin will command the highest price (and is worth the experience as uni this fresh is noticeably different from uni that was processed 24 plus hours beforehand). Uni is also available fresh (nama uni), frozen (reito uni), baked and frozen (yaki uni), steamed (mushi uni), and salted (shio uni), which is usually reserved for the lower grades of uni. Uni is also available as neri uni (blended urchin paste) and tsubi uni (a lumpy paste). The color and quality of uni is largely dependant on its diet, gender, and time of harvest. Size is also important as some lobes of uni can be too large for a piece of sushi. Catalina Offshore Products has a large selection of different kinds of uni available for those who enjoy it!